One advantage of having breakfast early was the delicious chocolate and cinnamon kugel - it seemed to be gone at 7:45 when the rest of our party arrived. "Jewish" food and "Israeli" food have so little in common. Jewish food is Eastern European specialties such as chicken soup, stuffed cabbage, and rugulash. Israeli food is Middle Eastern and Mediterranean specialties such as hummus, falafel, shwarma, and lentils. It was a pure joy to have a tasty kugel. To continue the theme of waiting around an hour, our tour bus arrived and left one hour later than promised. By 10am, we were off to see Qumran (where the Dead Sea Scrolls were located), Massada (mountain fortress commissioned by Roman King Herod and later the suicide pact site of Jewish rebel holdouts). For some reason, the tour company decided to drive right by Qumran and only making a passing reference to it (although it was listed in the tour brochure). But don't worry, they had to time spend a half hour at the Ahava dead sea cosmetics factory store moments later. At least the important things were attended to! I was wondering why Qumran appeared to be on a mountainside town, and not in the Dead Sea itself. "Should they have been named Dead Sea Region Scrolls?" I wondered to myself. Apparently the Dead Sea has been losing 1 meter of depth every year, and that's why the location of their discovery is so high about the Dead Sea level. Sad story. We hiked around Massada for an hour with an excellent guide. 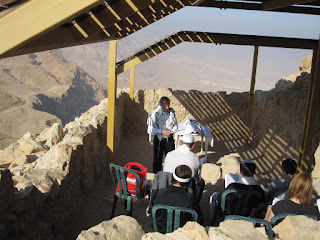 One highlight was the oldest active synagogue in the world (and probably the most majestic), where we witnessed a mountaintop Bar Mitzvah in progress (see photo). Our guide mentioned that the synagogue was shut down by the Romans in 67 AD. This is interesting as I believe this territory was re-acquired in 1967, making it a full 1900 years between Judean rule. 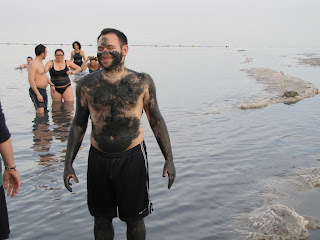 The highlight of the tour, by far, was the visit to a Dead Sea spa. 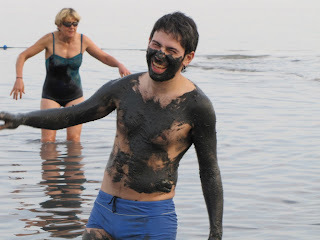 We thoroughly enjoyed the ritual of the hot sulphur soak, mud pit bath dive, and Dead Sea wading. I almost got stuck in the mud pit, it's that deep and treacherous. More info on that in Olga's blog. The section of Dead Sea we were in is extremely shallow. We were floating, but in most parts we were only a few inches above the sea floor. There is an Israeli-Palestinian-Jordanian plan in the works to build a "Peace Tunnel" to bring water from the Red Sea to the Dead Sea. We'll stay tuned for more on that! For dinner, we decided to walk around the hotel area, with a map and pointers on where to eat. I'm not sure if we ever made it to the suggested area, but when after what felt like an hour of walking down the designated street, we found a questionable "Mister Toast" and an anonymous stand-up sub sandwich shop. Asking a local for advice, we were told to take taxicab out of this boring neighborhood immediately and head over to Sima. Two of our three cabs arrived, but the third - with Phil, Olga, and Mike in tow - arrived at a different location. Thanks to cell phones, we were able to retriangulate where we were and remedy the situation. The appetizer plates flowed, the dinner was delicious (most of us had Shish kabobs), and the local Golan Heights wine was outstanding. Other than a couple of taxicab scams (short changing, not running the meter, etc) we all made it back to the hotel in one piece. 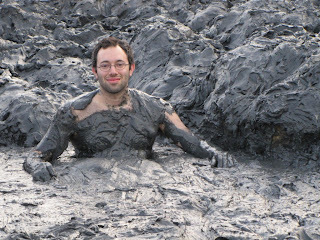 Hey Dave, mud is a great look on you!